Home » Lodge News & Events » Congratulations to Carmel 421’s Newest Master Mason – Chris Ndife! Congratulations to Carmel 421’s Newest Master Mason – Chris Ndife! Congratulations to brother Chris Ndife for being raised to the sublime degree of Master Mason! Major thanks also to brother Neil Helwig, Junior Warden for providing the delicious dinner for all the brothers who attended the event. 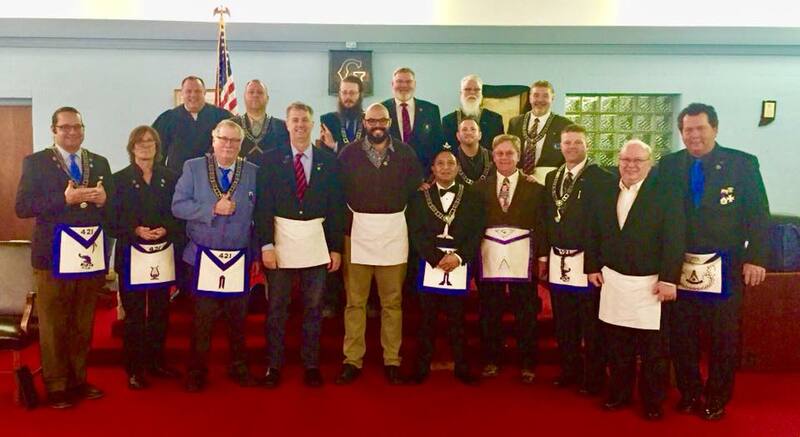 A Special thanks to our visiting brothers from Battle Ground Lodge #313 and everyone who made this night a memorable one. The event brings out the true meaning of brotherhood and the knowledge shared by all is invaluable and essential to the life of a Mason! (A Masonic) lodge will perform three degrees (initiation ceremonies) for your education and enjoyment. These ceremonies are very dignified and inspirational. At no time will horseplay or indignities enter into the program. These degrees are very solemn and Masons take the task of making Masons very seriously. After becoming a Master Mason (the third degree of the lodge) you may seek membership in the many other Masonic related groups these are often referred to as appendant bodies. This process of going through the degrees can be done traditionally in your own lodge with smaller groups that include other candidates entering your lodge just like you. This process would start with the Entered Apprentice degree and then move to the Fellow Craft degree and conclude with the Master Mason degree. This traditional process could take 3-6 months based on the system of the lodge you choose. This process is very rewarding and will help you get to know the brothers at your lodge. In the last several years we have begun another process called the One Day Class. This process was developed to help compensate for the very busy schedules of modern life. In this situation the Entered Apprentice Degree, Fellow Craft Degree and Master Mason Degree are all taught in one day. You will be watching the process as an exemplar is used to represent all in the room rather than in the traditional format where you are a participant in your own degrees. Whichever path you choose to becoming a Master Mason when it is complete you will be a Master Mason and can proudly consider yourself a member of the world’s oldest fraternal organization. There are many more degrees you can take and several different groups you may choose to get involved with as you grow in the fraternity. These are only available to you after becoming a Master Mason. For more information about Masonry, contact Carmel Masonic Lodge #421 and schedule a talk with a lodge member Mason. There is no pressure to join and you will most certainly come away with a better understanding of why Masonry is so important to the members of Carmel 421. As the lodge is only open for activities a few times a week, it is best to contact us via our email form, or call and leave a message at (317) 846-2346. 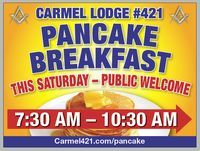 Just let us know you have an interest in Masonry and wish to talk with a Carmel Lodge member.